Embarking on a soul search to find her next home, Decleve set out on a cross country road trip that forced her to compare her own hectic life with a much simpler one. Here, she traversed the Caribbean for lusher pastures before giving the coast of Italy a go. Finally, she’ll get a taste of life in California with a tour along the west coast. Check back here each week to follow her journey across three countries in search of her new home. On my hunt for a new home, Los Angeles had long been on my radar. The many friends who had made the leap seemed healthier, happier, tanner; and having grown up in Northern California, where my parents still live, a West Coast homecoming seemed sensical. As a stylist and journalist, work would be an easy shift. So why was I dragging my feet? After a summer of travel, I came back to New York in September. The magic of the city seemed to explode upon my return. Cooler weather was settling in and friends flocked back after summers spent at the beach or abroad, ready to reconnect. Impromptu dinner parties, picnics in the park and an endless stream of work beckoned me to stay. But before falling back into my old relationship of love and hate, inspiration and exhaustion with NYC, I had one final experiment: Los Angeles. I had made myself a deal: one month to “feel it out” then I would either commit to Los Angeles or New York, but no more nomadic Natalie. My first week was torture. Just as the crisp air was brightening the leaves around New York City an unexpected October heatwave brought Los Angeles temperatures into the high 90s. I longed to be wearing sweaters and planning weekends upstate, but with the paved streets of LA amplifying the oppressive heat I felt like a cockroach chasing shade. Life in New York had been a well-oiled machine. 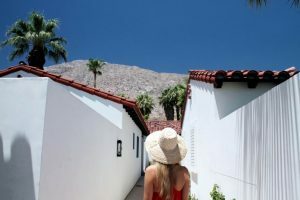 Work was a constant flow, and yet I craved a moment to breathe; the idea of slowing down in LA seemed more exciting than a packed New York social schedule. I had been craving a calmer lifestyle but now, spending my days apartment hunting, stuck in traffic and trying to suss out work opportunities, the slower pace was driving me crazy. I longed for the simultaneous chaos and comfort of New York, yet feared the ennui that had led me on this adventure in the first place. Still uncertain about where to replant my roots, I decided I would choose Los Angeles if I found the perfect apartment within my one-month timeframe. If not, New York would be there waiting for me. That night, my faith renewed and bolstered by the excitement of finally having an address, I went to meet Luca, the Italian boy I had met in New York on my birthday and rendezvoused with in Rome in August. Having met under auspicious circumstances it was time to finally go on a real first date. As if I needed more encouragement he coincidentally picked a restaurant three blocks from my soon-to-be new home.That night became one of many spent devouring each other’s words, the food on our plates nearly untouched. On a whim, we decided to drive to Palm Springs for the weekend. A mecca for all things mid-century modern, Palm Springs is like stepping into an episode of Mad Men. We stayed at the bohemian-chic La Serena Villas, wined and dined at L’Horizon’s SoPa restaurant, and drank rum cocktails from coconuts at Bootlegger Tiki. We lazily browsed the flea market and trolled for vintage Pucci at The Frippery. Surrounded by the desert as far as the eye could see, and only 130 miles from Los Angeles, I felt a million miles from nowhere. I thought of my frequent escapes upstate from New York City; mini adventures that became an extension of my life in Manhattan. Amorous and inspired, I entertained the idea of Palm Springs, Ojai, and Joshua Tree becoming the West Coast answer to my country weekends. As the warm, dry air blew in through the windows of Luca’s vintage Jaguar, I began to sense the possibility of a life out west. Now on the sunnier side of the country I’ve created a new routine; one that involves farmers markets, canyon hikes and meals in my garden. Erwhon may not invite the same quirky locals as my New York market, but their gluten-free bread selection is the stuff of health-nut dreams. I sleep without earplugs, a sound machine or an eye mask (all essentials back in New York) and health issues that plagued me for years have vanished. Los Angeles has indeed made me healthier and tanner, but happier…? In Goodbye to All That, Joan Didion famously chronicled her move to LA as the antidote to over-dosing on life in New York City. Perhaps it was naive of me to anticipate a similarly instant “click” when I made the same transition. Everyone tells me that “LA takes time to grow on you…like years.” But like any seasoned New Yorker, I’m impatient. Surrounded by the isolating suburban sprawl, I miss the vibrancy and the unplanned serendipity of New York. And so I go back…often. Adopting the “bicoastal” label, I head back to New York monthly, working with clients for a week or two at a time and using my time in Los Angeles for writing, media, and sleep. New York no longer makes me feel overwhelmed and now I relish the chance to spend days shopping for my clients and nights socializing and soaking up the city’s addictive energy. Then I bottle up that energy and bring it back to Los Angeles where I recharge my batteries under the warm California sunshine. In small bursts I can appreciate the best of each city—falling back in love with New York during every stint but by the end, craving the peace and calm of my West Hollywood casita. After months of simultaneously avoiding and craving stillness, in this fluidity I have finally found stability. Most importantly, after searching multiple cities across three countries, I’ve realized that what I was looking for was not an address, but was in my heart all along: home.